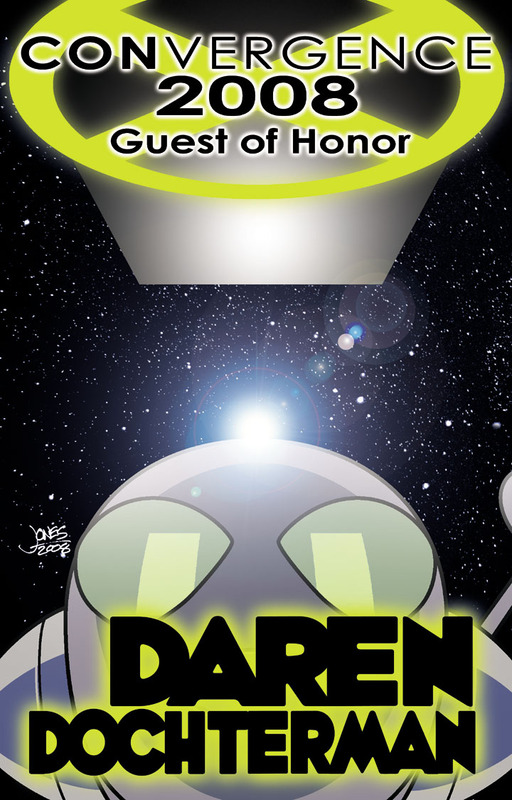 We’re counting down to CONvergence 2012 on July 5-8, sharing more art I’ve done for badges, this time for the Guests of Honor of CONvergence 2008. 1) Instead of the usual Friday-Sunday 3-day convention, we decided to start the convention Thursday and do a 4-day extravaganza. At the time, this was intended to be a one-year-only change. 2) We decided to bring back a ton of our favorite guests from past years. Our budget and logistical realities meant we couldn’t bring back everyone we’d have liked, but we brought back a bunch! 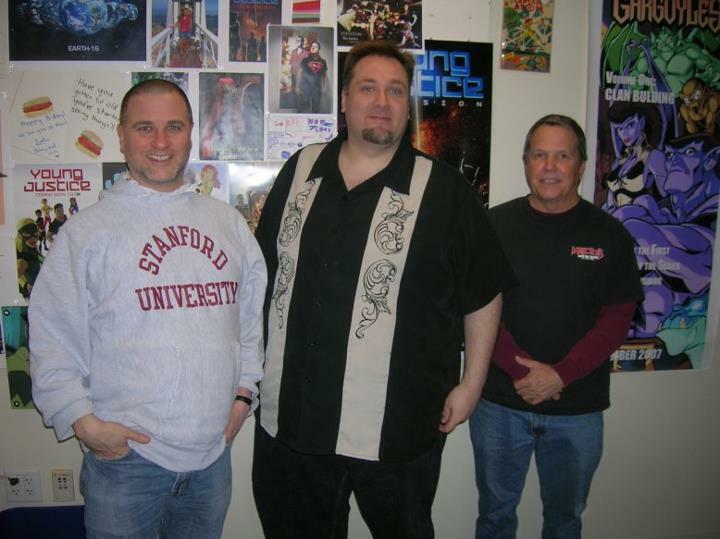 We only had two new guests in 2008, the rest were people we knew we had a great time with, and we were excited to have be a part of our Year 10 celebration! So I decided to ad a personal third crazy thing. 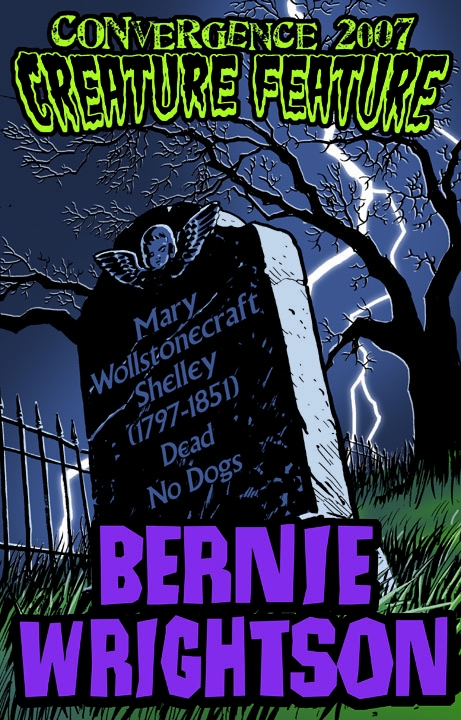 3) Continue the tradition of doing individual badge art for each Guest of Honor. Yeah, I could have just re-used badge art from a prior year for our returning guests, but aside from the fact that it would have felt like a cop-out, word got back to me that some of the guests we had lined up to return had expressed their excitement to see what I had drawn for their badge art this time. So I almost had no choice! The one thing I had going for me was that I had free reign to use Connie if I was stuck for any other idea, as the returning guests would already be familiar with our convention mascot! First up, Crist Ballas, make-up man extraordinaire. 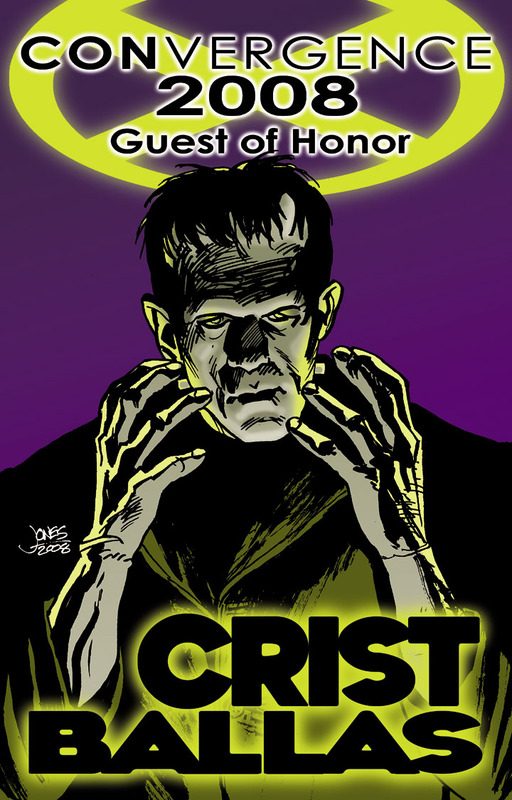 I learned that the Jack Pierce make-up for Frankenstiein’s Monster was one of Crist’s favorites and an inspiration, so that took care of Crist! 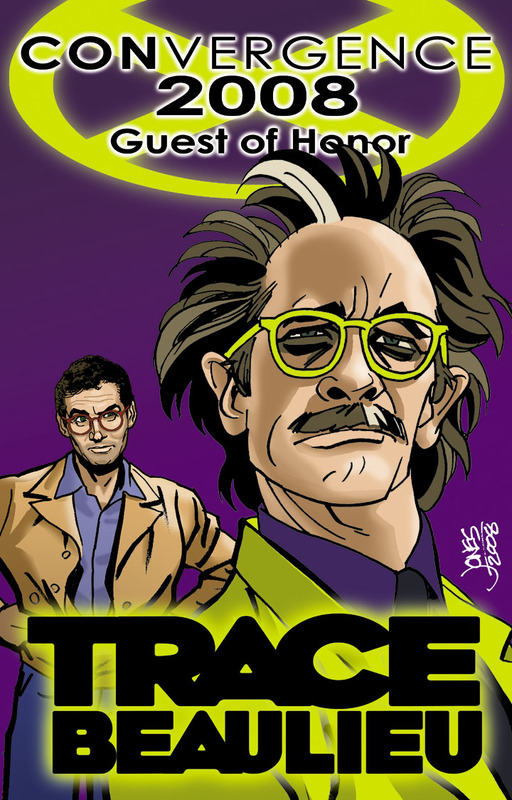 Trace Beaulieu’s badge featured not only his Dr. Clayton Forrester character from MST3K, but I have the ORIGINAL Dr. Clayton Forrester from War of the Worlds looking on with disapproval. 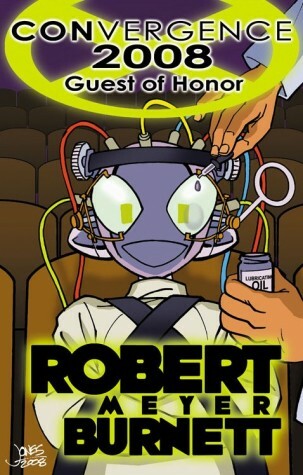 Robert Meyer Burnett is a huge Clockwork Orange fan, and his production company is called Ludovico Technique for the rehabilitation process from that film. Connie doesn’t seem to mind being subjected to it! 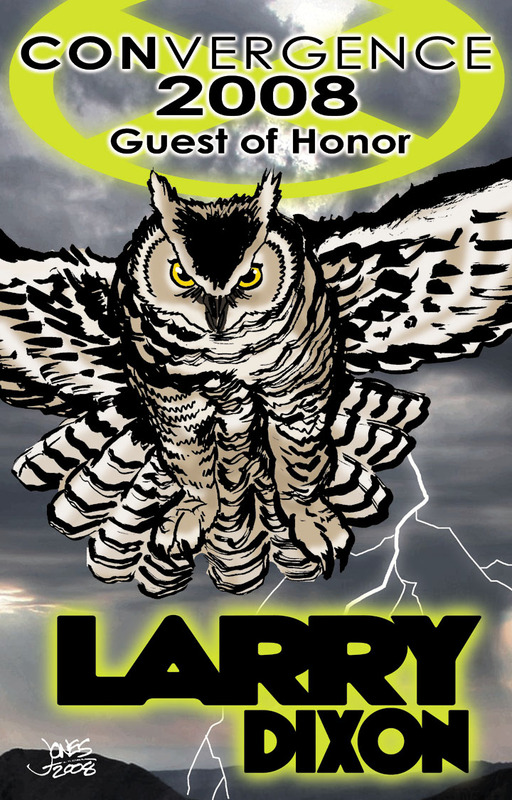 Larry Dixon his a big owl fan and he does work with raptor centers, which was the thought behind his badge. 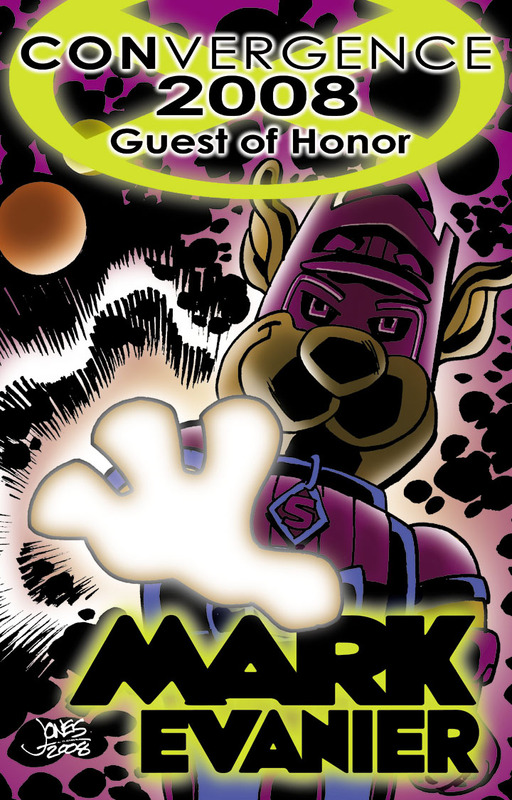 Among the things Mark Evanier is known for, two of the biggest are his association with Jack Kirby and the other is writing for TV animation, which includes work for Hanna Barbara and a role in the creation of Scrappy Doo. 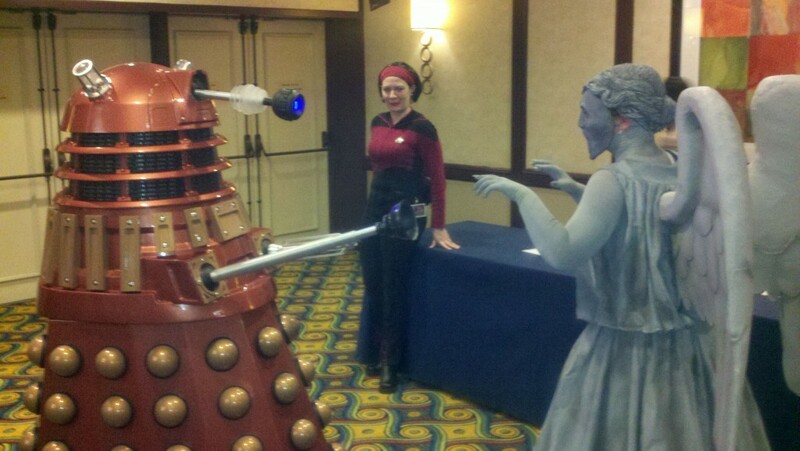 Last month I had the pleasure of returning to the great Los Angeles Doctor Who convention Gallifrey One. I started to draft an extensive write up on the trip, but upon my return found myself so busy I haven’t been able to finish the blog entry – until now! I traveled to the convention with the ever-lovely and photogenic Hal (she who is awesome and built this blog), who was making her first visit to Los Angeles. 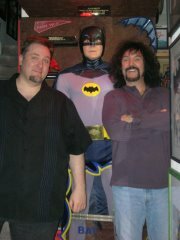 After checking into the convention hotel we made our way to Hollywood Boulevard to meet my friend Josh Elder for dinner. 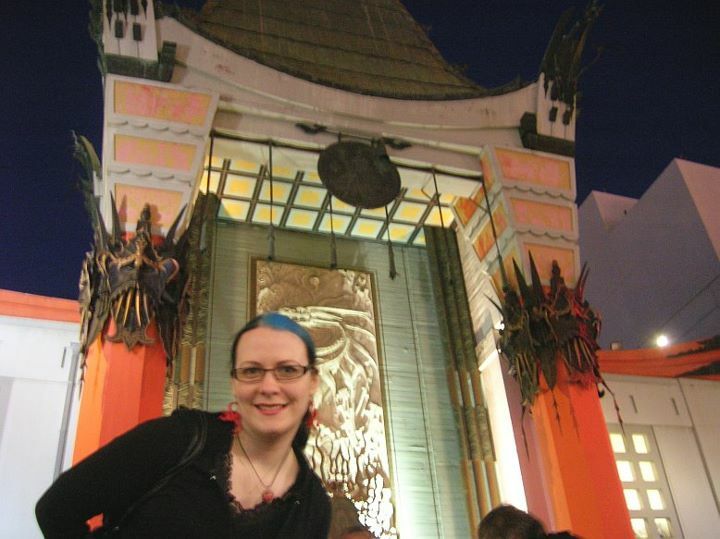 We arrived a little before Josh, so Hal and I spent some time exploring the Hollywood Boulevard tourist attractions, primarily Grauman’s Chinese Theater. The forecourt in front of Grauman’s is of course home to its famous collection of celebrity signatures, handprints and footprints in the pavement. Hal is generally not big on seeing famous landmarks or other touristy stuff, but she was still pretty delighted to find the signature and handprints of William “The Thin Man” Powell and the ENTIRE CAST OF STAR TREK! 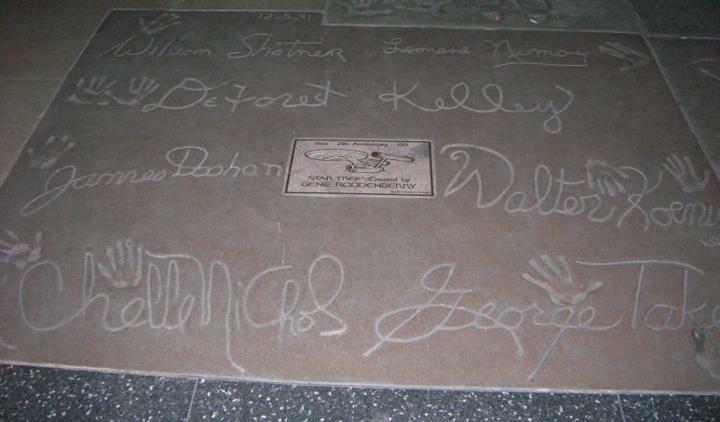 The cast members all left hand prints in addition to their signatures. It should be noted that James Doohan used his right hand with the missing finger (good for him), and Leonard Nimoy placed his hand in the position of the Vulcan salute. After dinner with Josh, Hal and I headed back to our hotel where we eventually met up with Mike and Alicia with whom we were sharing a room for the weekend. 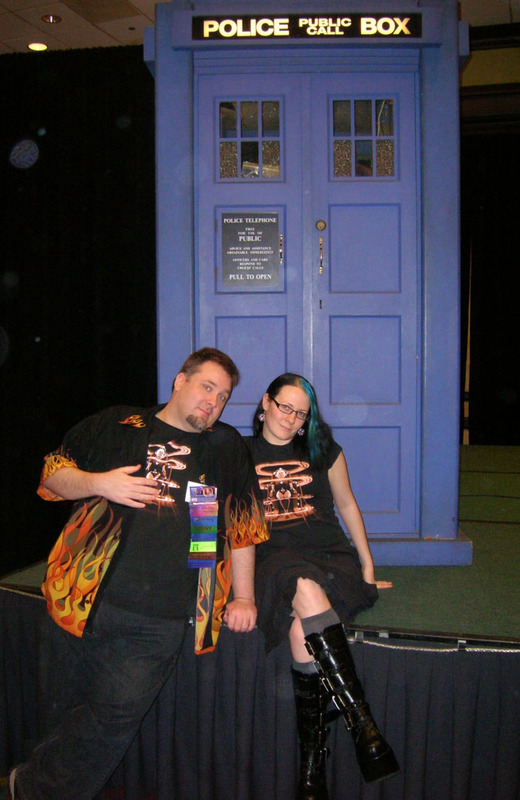 The next morning the convention began, and the first tasks at hand were to pick up our badges and get my art entered into the Gallifrey One Art show. 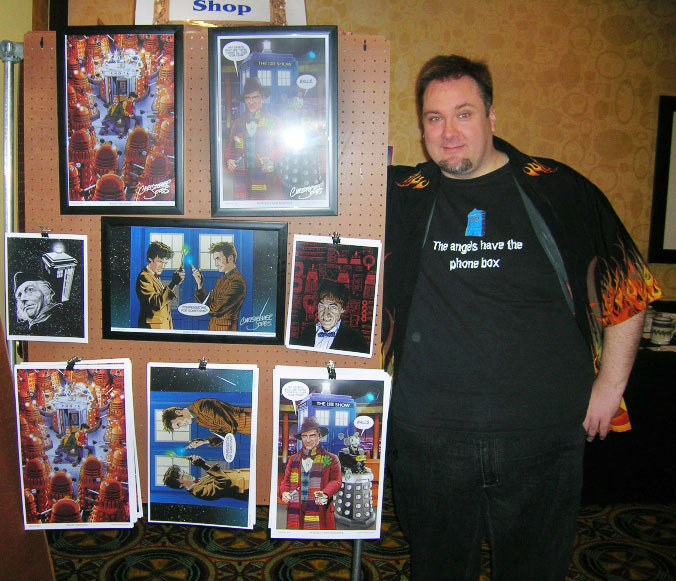 I feel obligated to mention that the various Doctor Who-related prints I had in the art show are available in my Etsy Store. 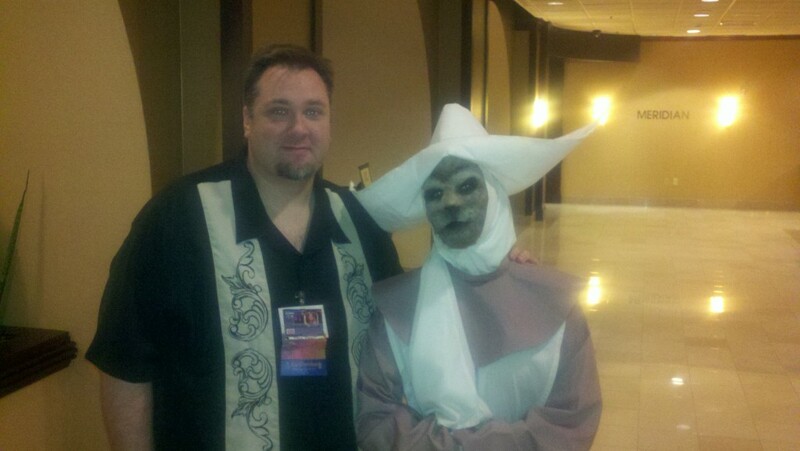 If you don’t want to pay the shipping fees, look for me at my next convention appearance. 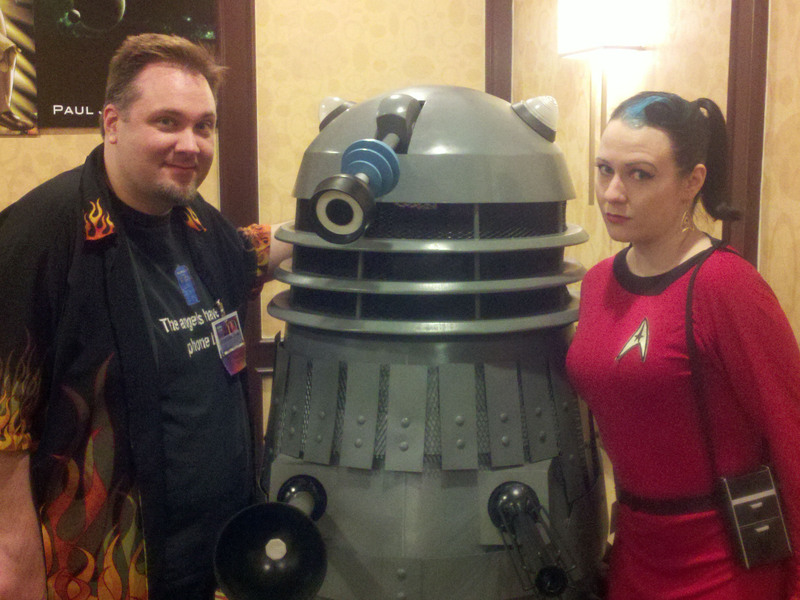 The rest of the weekend was largely a blur of panels, celebrity spotting and enjoying amazing cosplay (see below). I had a chance to reconnect with a few folks I don’t often see, and got to meet some great new people. 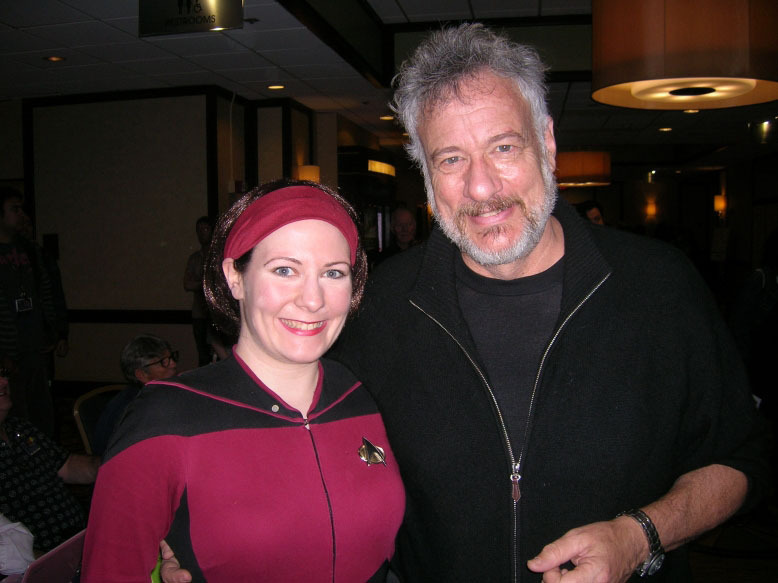 One highlight was getting to witness what was unquestionably the highlight of Hal’s weekend: Meeting John DeLancie. John was at the convention because of his role in Torchwood: Miracle Day, but ever the Trekkie, Hal was excited to meet him because he was Q in Star Trek: The Next Generation. Note the difference between Hal’s usual, easy smile for the camera and the extra-wide grin that threatens to rip her face in twain in the picture below. 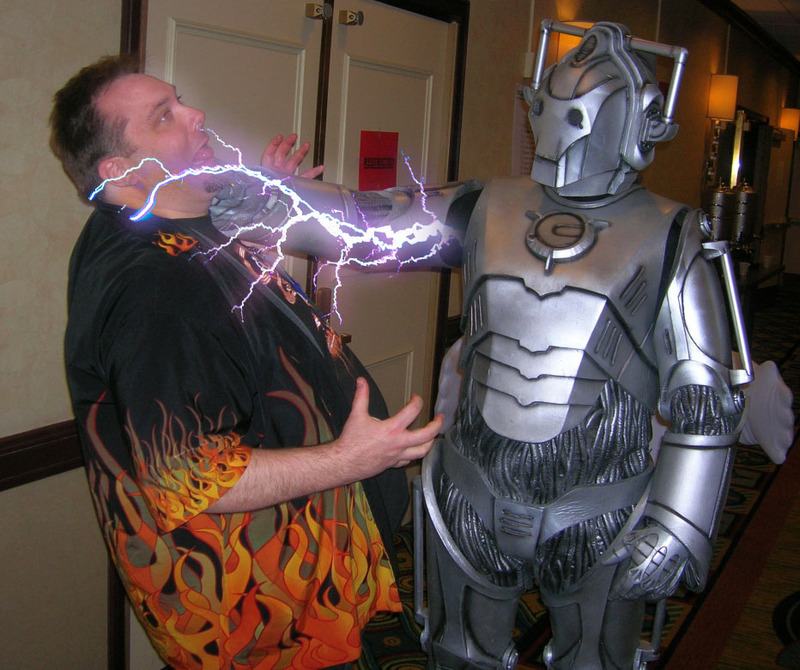 We met a Cyberman, but he seemed to take to Hal more than he did to me. 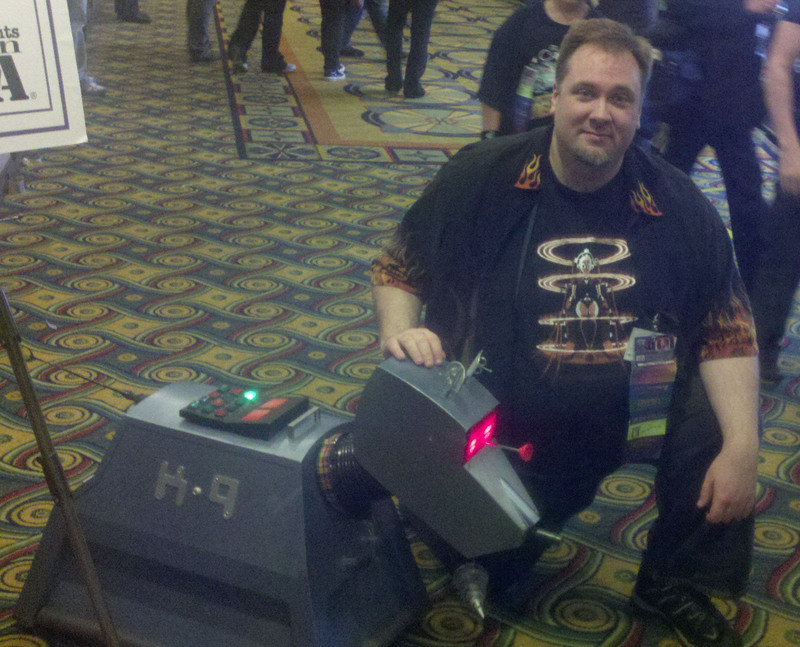 I got to meet K-9, which was a treat. This replica looked *perfect* and was zipping about on remote control, as there were no 1970s-era BBC-TV cameras to interfere with it or vice-versa. 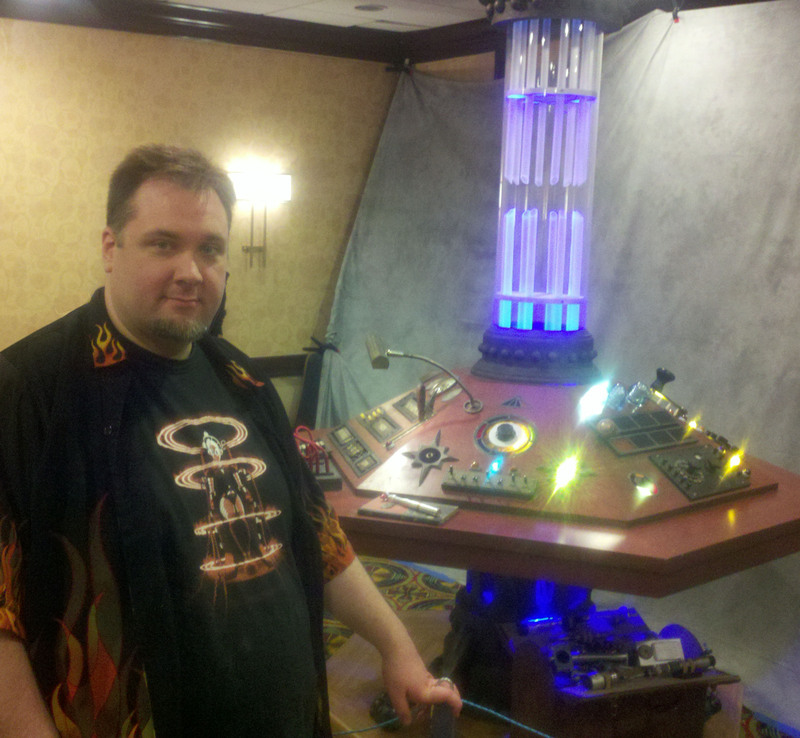 I also got to see the beautifully restored TARDIS console prop on display at Gallifrey One. This prop was the centerpiece of the TARDIS set that was arguably the best thing about the 1996 Doctor Who TV-movie. You can read more about the loving restoration of this prop here. This photo doesn’t fully convey how fabulous this lady was. 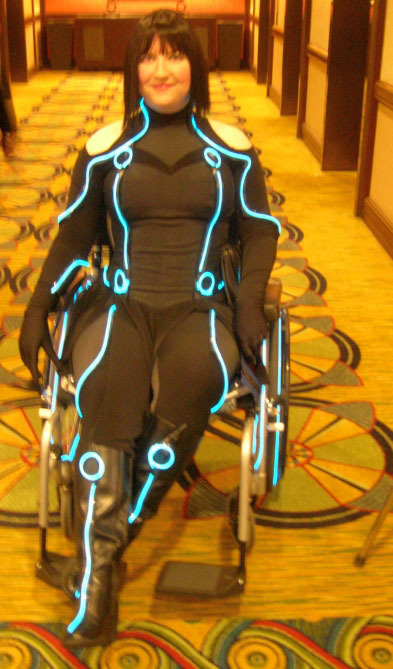 The wheelchair was totally tricked out with Tron detailing. 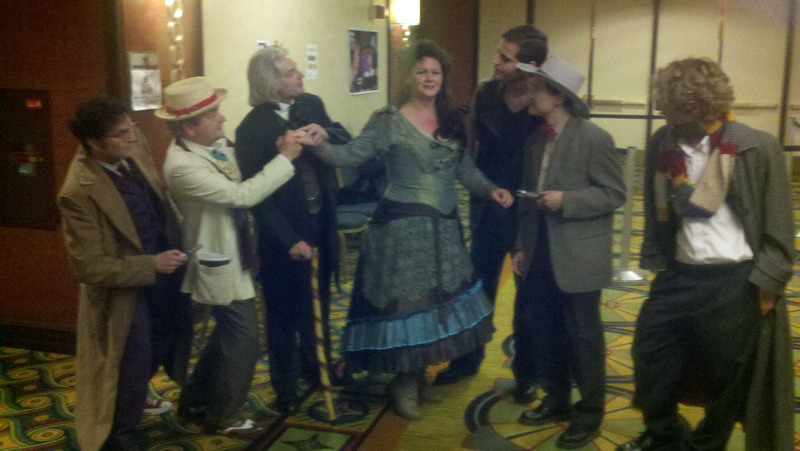 Idris made a cosplay appearance at the convention, as well as several suitors. 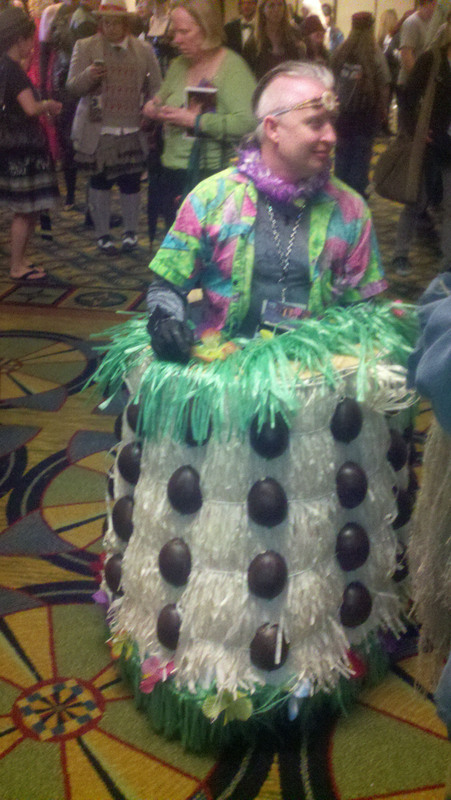 The Tiki Dalek made an appearance at the con, along with Tiki Davros. 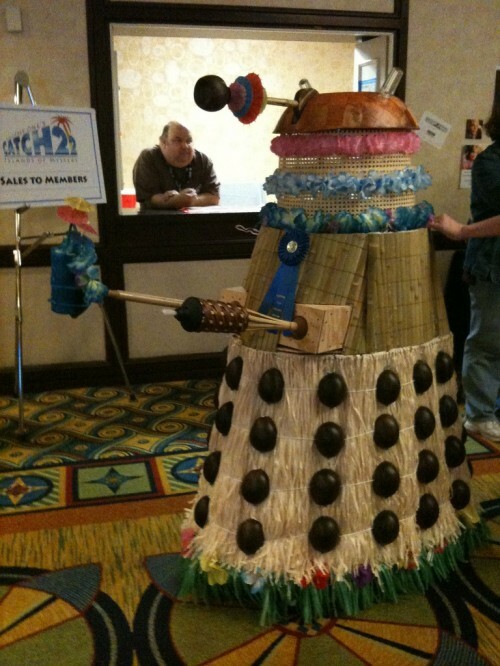 Yes, those are coconut halves serving as Dalek bumps. 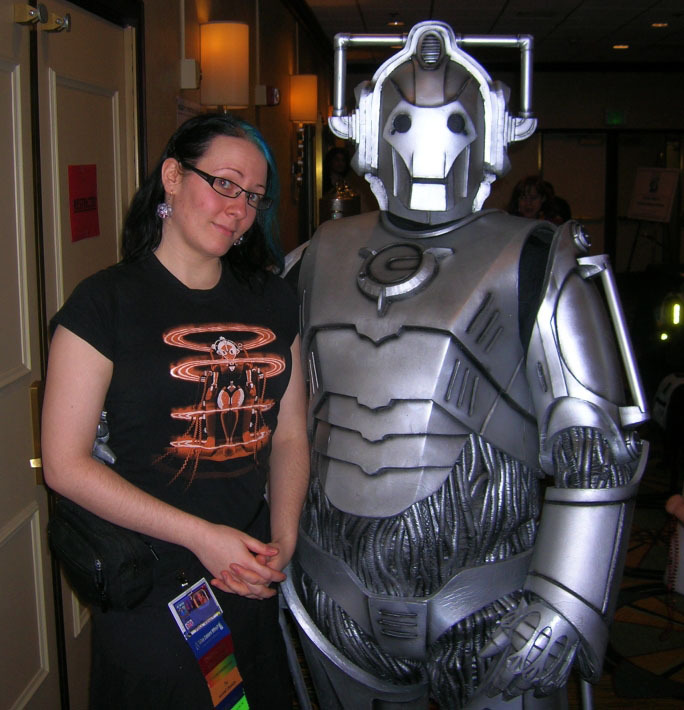 While Hal was pleased to use the recently-announce Star Trek/Doctor Who crossover comic coming from IDW as an excuse to wear some of her standard Star Trek costumes at the convention, she did don her Novice Haim outfit, complete with fur-covered mask by Bill Hedrick. Hal and I both huge fans of NBC’s Community, and are particularly enamored of their recurring references to Inspector Spacetime, a Doctor Who pastiche. 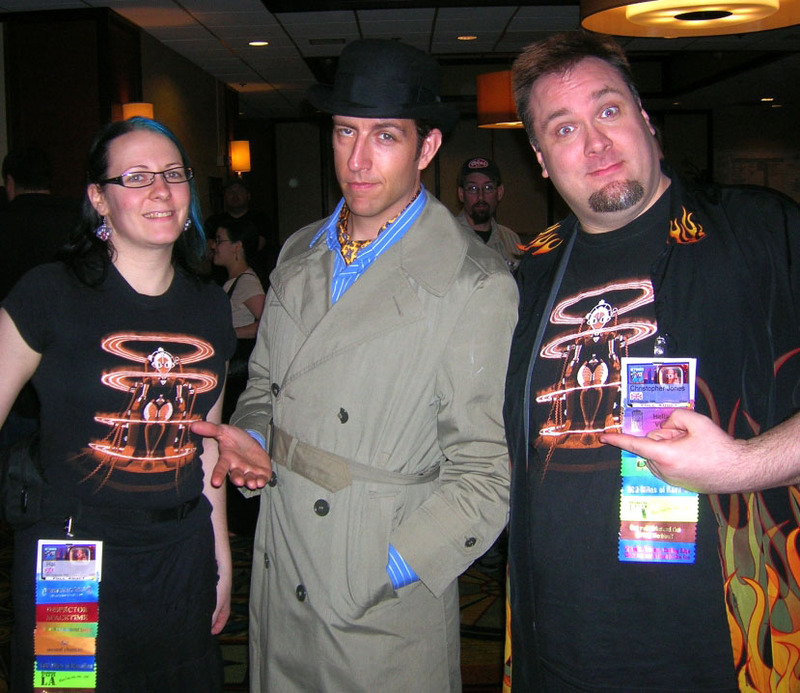 So we were delighted to meet Inspector Spacetime himself, Travis Richey, at the the convention! 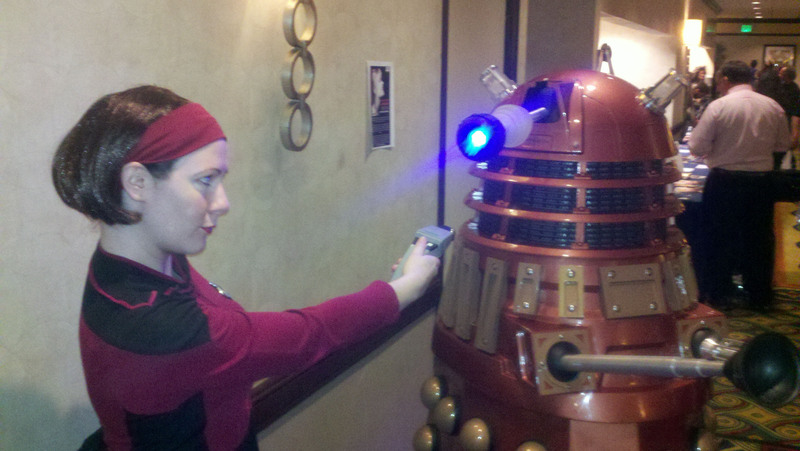 The convention was a lot of fun, and I hope to be there again for Gallifrey One in 2013! The Monday after the convention Hal and I rented a car and changed hotels, as we were parting company with Mike and Alicia for the remainder of the trip, and the Mariott’s convention rate was over. I found a fun, inexpensive little hotel called the Tangerine Hotelin Burbank, centrally located for the remainder of out plans in Los Angeles. 1) The Late Late Show studio is even smaller than you’d think from watching the show on TV. Imagine how big you think it might be. It’s half that size. 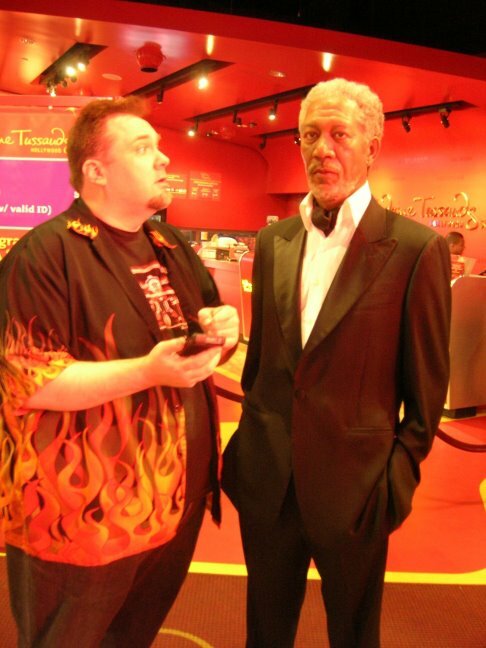 2) All the pre-show coaching and the warm-up comedian made the experience feel like a job interview to Hal. 3) When you hear that a studio is kept cold, make sure Hal brings a winter coat. Seriously. That said, it was fun seeing Craig Ferguson in person, especially when I’d just done a print riffing on Craig’s Doctor Who fandom. No, I didn’t get to give Craig a copy. You can’t bring ANYTHING like that into the studio and there’s a policy against trying to do that sort of thing. Tuesday was a very full day. We started out by visiting the DC Entertainment offices in Burbank, and I got to finally meet Jim Chadwick, who has been my editor on Young Justice since I started work on the title a year ago. 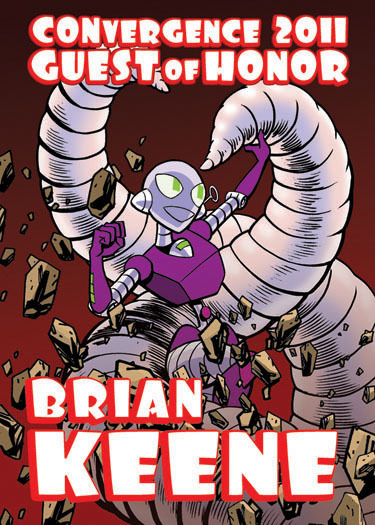 That’s part of the fun of the comics industry – you do so much long-distance collaboration and often never meet the folks you communicate with by email and phone. The DC Entertainment offices are very cool. Like the DC Comics offices in New York they have a ton of fun memorabilia on display, but the DC Entertainment building is a little newer and has a slightly snazzier feel. Jim and his assistant Sarah Gaydos were good enough to give me a tour, and I got to see everything from the library to the bullpen where all kinds of digital production work is done in-house using tablets and other hardware that would make any computer graphics person drool. 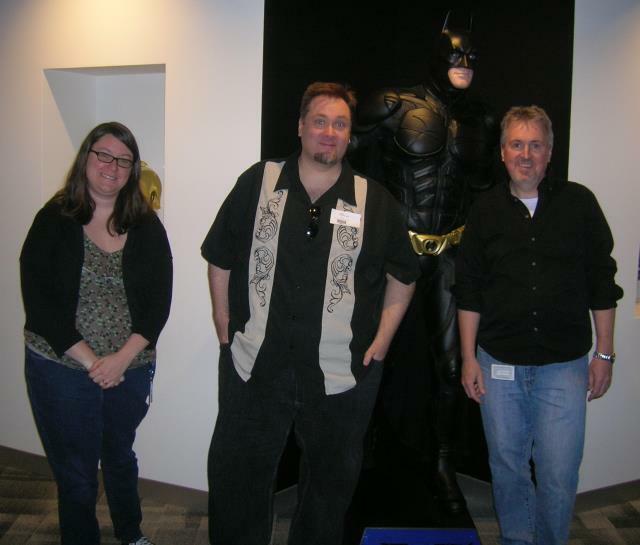 After leaving DC, Hal and I met Greg Weisman and Kevin Hopps for lunch at Warner Brothers Animation. Greg is a producer and the head writer for the Young Justice animated series and Kevin is a writer for the show, and together they write the Young Justice tie-in comic that I draw. I’ve met Greg before on a few occasions but I hadn’t met Kevin before. I got to see the offices where the Young Justice staff work, and Greg and Kevin and I got to talk about plans for the comic as well as the peculiarities of the comics and animation businesses. All in all it was a grand time. I wanted to share an observation I’d made when I’d visited DC and Marvel Comics in New York and it was true at DC Entertainment and Warner Brother Animation as well. There is a cubicle farm quality to some of the office space at all of these places, similar to what you might see in offices at any large company. But think of all the clipped out newspaper cartoons, calendars, and personal effects reflecting every possible personal interest those corporate workers might have that is considered permissible to have in their workspace. Now replace all of that with comics stuff. 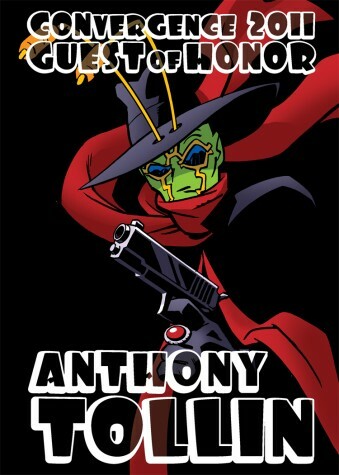 Cover art. Cartoons. Action figures and toys. Just massive amounts of the stuff, piled on every horizontal surface and pinned to every cubicle wall. With high-end prop replicas and movie memorabilia in glass display cases and lighted alcoves. And the people working there are all creative, talented people doing something for a living that’s somebody’s dream job. THAT’S what it’s like visiting these places. It’s fantastic. With Rob and Bob. Bob's looking at me. Tuesday night we met up with voice actor Wally Wingert and director/producer Robert Meyer Burnett for dinner at a restaurant of Wally’s choosing. 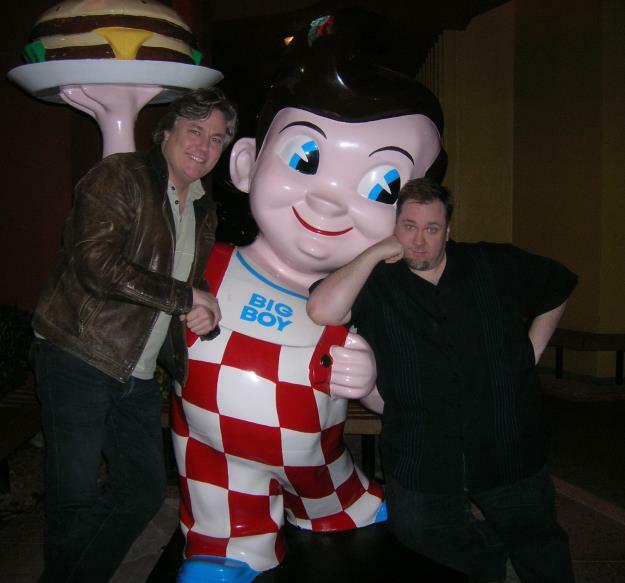 That ended up being the Bob’s Big Boy within walking distance of our hotel. Hal and I arrived first, and were just starting to chat with Rob after his arrival when Wally called and said his was three minutes away and we HAD to meet him out in front of the restaurant. It was obvious he had something to show us. 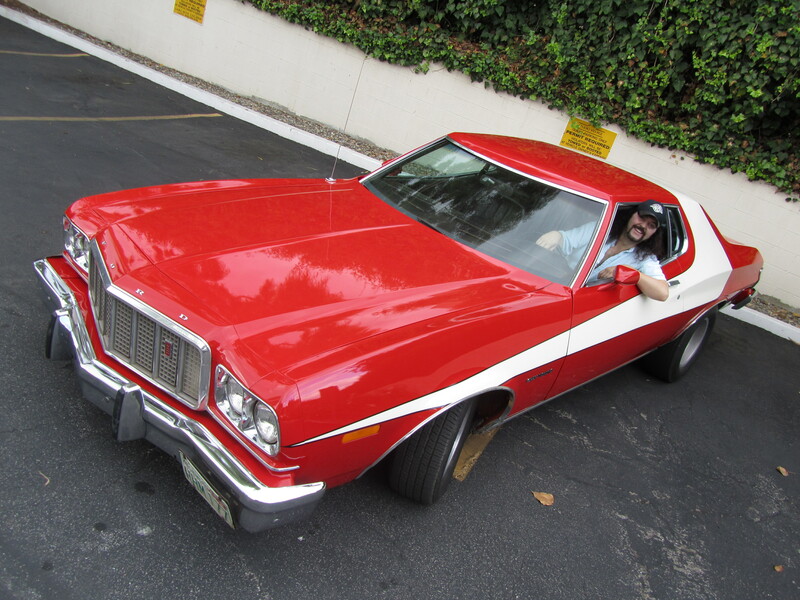 We dutifully assembled at the front entrance of the restaurant in time to see Wally pull up in his newly acquired Torino that was a perfect replica of the Starsky and Hutch car. Dinner was lovely, and afterward Hal and I paid a visit to Wally’s apartment which is packed to the gills with Wally’s amazing collection of Batman, Star Trek, Any Kaufman and other pop culture memorabilia. I never got to visit Forrest J Ackerman’s Ackermansion, but getting to visit Wally World took a little bit of the sting out of it. After that it was back to the hotel for some sleep, since we had a redonkulously early flight back to Minneapolis the next day. It was a grand adventure, and I can’t wait to visit LA again next year!